Anyone who has ever been involved with selecting new materials will likely tell you that the process is rewarding, but complicated. 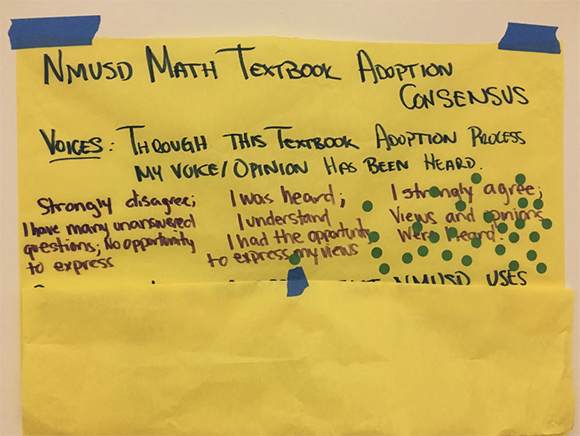 This was certainly our experience in 2017 when the Newport-Mesa Unified School (NMUSD) district selected a new K-5 math program through a comprehensive, teacher-led adoption process. In a truly collaborative selection process, school leaders need to be prepared to tackle divisions in creative ways. That’s what NMUSD attempted to do when we were nearing the end of our math adoption. For seven weeks, teachers piloted two programs and now it was time to make a decision. However, we found ourselves grappling with data that was split right down the middle, with half of pilot participants championing one program and half advocating for the other. That was the challenge of this particular adoption: how polarized our pilot data was. We decided to bring 30 teachers together and apply a day-long consensus process to decide what our final program recommendation to the school board would be. Teachers showed up with divided opinions (supported by data on both sides) about the program they hoped to choose. But the pilot data wasn’t enough. As a district we were committed to honoring the pilot data as well as the evidence we gathered from EdReports.org about the quality of each program. But the reality is that data informs decisions rather than making decisions. We needed more than numbers to come to a conclusion. Using consensus protocols to reach our decision proved to be especially critical in overcoming our divisions. And this process has been critical in the ultimate success of implementing a new program across the district. It might be best to start with what consensus is not: Consensus isn’t voting. A majority isn’t enough to declare victory and move on; what matters is the will of the entire group. Because of this, true consensus means there aren’t winners and losers. 3) It’s clear to me that the will of the of group has emerged around this proposal. We developed this definition from an excellent resource on consensus and professional learning committees. The act of developing a shared vocabulary around consensus was an important first step. With our consensus definition in mind, school-based and district staff came together to design the activities that would help participants reach consensus. This was truly a team-effort and I las humbled by all that I learned as we worked together. The specific protocols we chose required little trust among the participants at the beginning of the day and required high trust at the end of the day. We took into consideration that teachers came from different schools, different grades, and had little interaction with each other outside the adoption process. The impact of our day of consensus cannot be overstated. Though the program we ultimately selected is high-quality and aligned to college- and career-ready standards, it is not an easy one to implement. Because all of the teachers in the room had the opportunity to examine the data, air their questions and concerns, and have meaningful discussions with each other, the experience developed buy-in around the chosen program and a commitment to tackling implementation challenges. Read the full details of our consensus process. The buy-in has lasted throughout the year, with teachers helping to train other teachers on the new program in a professional development series and with evident effects in the classroom. Identify a very clear problem or opportunity your district seeks to address. Everyone should be on the same page about what they are trying to achieve. Be clear on the values and norms that will guide your decision. These values will be the bedrock of the process you design and shape how you frame each of the consensus activities. What is your definition of success? To achieve that success, what are the non-negotiables: what do we need, what do we want, and what would simply be nice to have? In our district, the needs were that the program had coherence, rigor, and focus. We wanted the program to rate high on usability and universal access. Easy implementation would have been nice but not a mandatory. Establishing a shared solution criteria is important to inform data collection and provides a lens to consider data as possible adoptions are considered. Instructional materials adoption is important and high-stakes. The decision you’re making through consensus should be taken seriously, but that doesn’t mean the process can’t be fun and celebratory. This is an exciting day, too! Choosing curriculum has the potential to be transformative for both teachers and students. The more celebratory (e.g. music, high-energy activities, highlighting accomplishments), the more likely the participants will feel a sense of camaraderie as they wrestle with a challenging decision. In a successful consensus process, difficult conversations are crucial. You want every issue to be surfaced. Facilitators, however, must be very careful not to let their perspective shape the conversation. It would defeat the purpose of consensus to have facilitators leading the discussion down a predetermined conclusion about a set of materials. It’s the participants who must examine and express their views about the possible outcomes; it’s their voices that must surface. Throughout our process, we had committee members periodically ‘dot in’ and confirm that their voices were being heard and that they could see the will of the group emerging. By doing so, we created our own artifacts that could be shared with others: our school board, union leadership, and other teachers throughout the district. Sharing evidence that consensus was reached allows the work of that day to continue to have impact long after it is over. Chief Strategy Officer, Lauren Weisskirk, shares a tale of two adoptions: one that planned a rollout for its new instructional materials and one that didn't. Educator Shannah Estep shares three tips that will set your adoption process on the right track and guide you in your quest for high-quality, aligned instructional materials.